If you’ve ever seen Lord of the Rings you’re familiar with the character Gollum. “My precious,” I whispered in my best Gollum voice as I opened the box. Honestly, I just couldn’t help myself. It was even prettier in person. 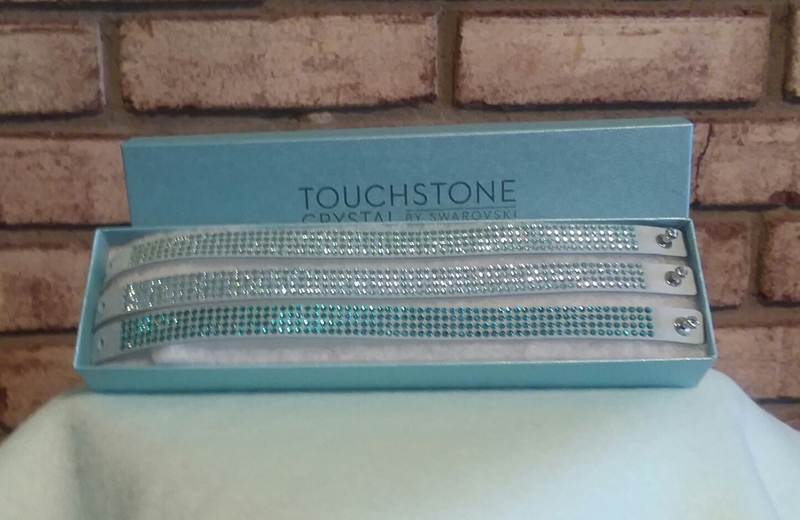 My new Swarovski Touchstone Crystal Aqua Tri-Wrap Bracelet well exceeded my expectations. Three sparkling crystal-embellished leather bracelets beckoned me to put them on. I was practically giddy as I pulled out my mint/teal colored fleece to use as a backdrop for photos. Each of the bracelets and even the box they came in were perfectly color-coordinated against the fleece. It was truly a serendipitous moment. If I had any doubts about making this purchase they quickly evaporated as I took a few photos. The lightweight bracelets are 7-1/2 inches long, can be worn separately, or connected for a total length of 23 inches. As soon as I saw my friend Melody of Sparkle With Melody show this jewelry I knew it would become mine. The reasons? The sparkle, color, versatility of the pieces, and did I mention sparkle? The Aquamarine, Light Turquoise, and Blue Zircon colored crystals on aqua suede bands are dazzling. The ability to wear them in a multitude of ways was very appealing to me. The featured image is the open box displaying the 3 bracelets sitting atop the fleece against a brick background. Image 1: A tri-collage (clockwise top left to right). Tri-wrap bracelet on my wrist, three stacked bracelets in front of its box, the featured image is on the bottom. Image 2: Closeup of the stacked bracelets in front of the Touchstone box.